Measles is a viral infection that is passed by an air-droplet way, is characterized by cyclic course, syndromes of intoxication, catarrhal inflammation of respiratory tract, conjunctiva, and rashes on the skin. 1. Source of infection – infected person during last 2 days of incubation period, catarrhal period, and 4 days period of eruption (in case of complications –10 days period of eruption). 2. Infection is transmitted by inhalation of large and small airborne droplets. 3. Susceptible organism – no immunized people, older than 6 month, which never had measles. • The primary site of infection is the respiratory epithelium and conjunctiva. • Local replication of the virus is followed by viremia (primary). • During this phase virus is spread by leukocytes to the reticuloendothelial systemwhere it replicates. • Following necrosis of white blood cells, a secondary viremia occurs. • With the development of specific antibody and cell-mediated responses, viremia is terminated and the illness resolves. 1. The incubation period is 9-17 days, in those who has received specific immunoglobulin for prevention – it may be longer (up to 21 days). 4. Prodromal period is the next, lasting 3 to 5 days. The classic three “C’s” (cough, corryza, conjunctivitis) make their appearance. The enanthema of measles occurs, Koplick’s spots (small, bluish-gray papules on a red base) localized on entire oral mucosa. They usually disappear by the second day of the exanthema. Temperature is usually high at first day. 5. Exanthema period: Second increase of temperature. Initial lesions are noted behind the ears on the forehead and face. During 3-4 days they spread downward, involve the trunk and extremities. The rashes consist of an erythematosus maculopapular eruption. They are initially discrete but then became confluent on the areas of initial involvement. 6. Pigmentation period progresses in the same fashion as the appearance of the rashes. As the rashes resolves, a brownish desquamation may occur. - measles in person who receive antibiotics and hormones. - not smooth, uneven (complicated). - late (in pigmentation period). secondary bacterial – otitis media, pneumonia, gingivostomatitis, pyelonephritis, diarrhea, dermatitis. 2. Reduction of the disease periods. 3. Unexpressed clinical signs (catarrhal phenomena, fever, small unabundant rashes with the shortened staging and pigmentation). 4. Complications are more frequent. • Common laboratory tests are non-specific, CBC – leucopenia, lymphocytosis, eosynophylia, and thrombocytopenia (may be). • Cytoscopic examination of smears from the pharynx – presence of typical multinuclear giant cells. • Viral isolation is technically difficult. • Immune enzyme analysis (ELISA) – presence of Ig M antibodies in acute period. • Serology (DHAR, PHAR) is confirmed when fourfold or greater rise in antibody titre or the presence of specific Ig M antibodies. • Measles, typical form, period of exanthema, moderate severity, uncomplicated. obstruction syndrome, Respiratory insufficiency 2nd degree. 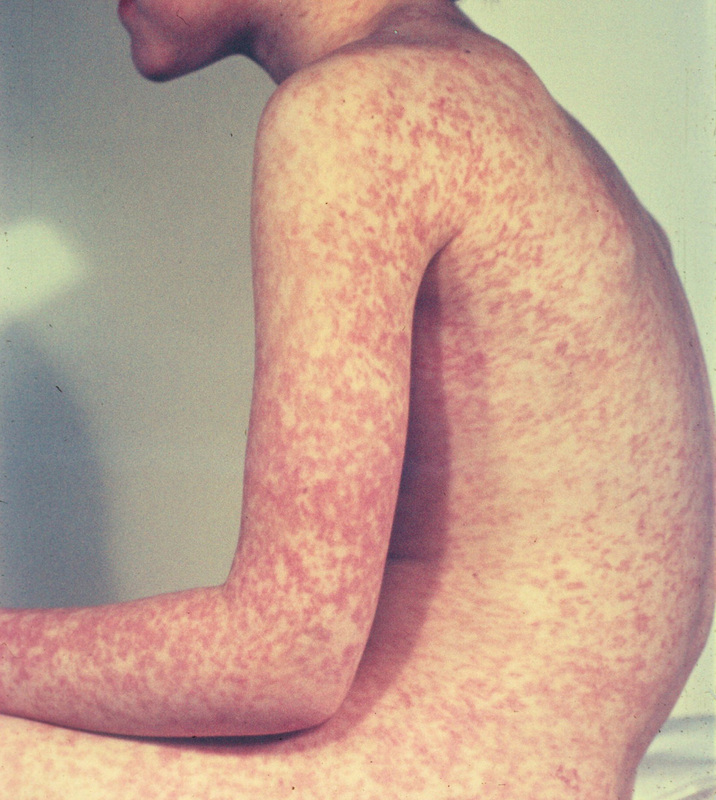 Differential diagnose should be performed between scarlet fever, Epstein-Barr viral infection, meningococcal sepsis, pseudotuberculosis, Kawasaki syndrome, Stevens-Johnson syndrome, adenovirus, enterovirus infection, diaper rashes (photo 1), Rheumathoid arthritis systemic form (photo 2), and allergic rashes (photo 3-10). During prodromal period – between other upper respiratory tract viral infections. 1. The severe form of disease, when appears need in undertaking of intensive therapy; patients with moderate forms at age before 3 years. 2. Sick children from families with bad social-home conditions, especially in the event of impossibility of their isolation to prevent infections transmission. 3. Absence of conditions for examination and treatment at home. 4. Sick children from closed children institutions. Noncomplicated mild, moderate measles and atypical forms do not need medicine. 2. Regular ventilation of the room. 5. Control of fever (when the temperature is more than 38.5-39 °C); in children before 2 mo and in case of perinatal CNS damage, seizures in the history, severe heart diseases – when the temperature is up to 38 °C with acetaminophen (paracetamol 10-15 mg/kg not often than every 4 hours (not more than 5 times per day) or ibuprophen 10 mg/kg per dose, not often than every 6 hours. 6. Nasal drops (in infants before 6 mo – physiologic saline solutions as Salin; in elder children – naphtizin, rhinasolin, nasivin for children 1-2 drops 3 t.d. in the nostrils, not more than 3 days). 7. In case of dry cough – cough suppressors (such as dextramethorphan, synecod). 8. Mucolytics in case of the moist nonproductive cough (ambroxol, acetylcystein etc.). 9. Looking after oral cavity (gurgling with boiled water, antiseptic fluids). 10. Looking after conjunctiva (washing with boiled water, concentrated tea, sulfacyl Na in drops). • In case of bacterial complication – antibacterial therapy should be used. • In case of severe episodes – corticosteroids (1-2 mg/kg for 2-3 days). • In case of croup: mist tent with 25-30 % oxygen inhalation, antianxiety medicines, steroids and mechanical ventilation in severe cases. 1. Bed regimen till body temperature normalization, disappearance of general cerebral and considerable improvement of focal neurological signs, not less than 14-16 days. 3. Brest feeding or bottle feeding by adopted formulas for infants, in the first day 1/2-1/3 of average volume with a next increase to the complete volume during 2-3rd days. 5. Oral fluids intake corresponds to age norms (with including the IV fluids). 6. Antibacterial therapy: for infants at presence of concomitant bacterial infection, chronic infection, inflammatory changes in the CBC (by the broadspectrum antibiotic in average therapeutic doses, a short course). • Vascular medicine (penthoxyphyllin, nicergolin and others like that). 1. Specific active immunization by MMR vaccine (measles, mumps, rubella) at age 12 months. Revaccination at 4 to 6 years or at 10 to 11 years (in Ukraine revaccination in 6 years). 2. Specific passive prophylaxis with immune serum globulin in a dose of 0.25 ml/kg as a postexposure prophylaxis. Key words and phrases: measles, Morbillivirus, prodromal period, exanthema period, enanthema, Koplick’s spots, maculopapular rashes, spread downward, cleaning (pigmentation) period, brownish desquamation, giant-cell pneumonia, specific and nonspecific prophylaxis.